Marieke van Hal is the Founding Director of the Biennial Foundation which is co-organising the world's first Biennal Forum this month in Gwangju, South Korea. The event is supported by the Asia-Europe Foundation as part of the programme Creative Encounters: Cultural Partnerships between Asia and Europe. Veeranganakumari Solanki: As the Director and founder of the Biennial Foundation you have incorporated copious research into the subject from creating a cohesive platform of information of Biennials around the world, to the Biennale Reader, and now initiating the first World Biennial Forum (WBF). Could you briefly talk about the history and development of the WBF? Marieke van Hal: First, I will have to explain about Biennial Foundation. The founding of Biennial Foundation is related to the outcome of the European Biennial Network. In 2007, in my capacity as former Director of the first Athens Biennial, I initiated the European Biennial Network (EBN), which was supported by the European Commission. Partners were the Athens Biennial (initiator), the Liverpool Biennial, the Istanbul Biennial, the Berlin Biennale, and the Lyon Biennale. Various workshops and discussions took place in the two year time period (2007-2009) of the existence of this network. Drawing from this exchange, the Biennial Foundation was founded, based upon a shared belief that the collective knowledge and networking activities related to biennial organizations can be best handled by an independent organization, reaching beyond the borders of Europe. The World Biennial Forum has been conceptualised as the most important activity of Biennial Foundation. VS: What was the main reason to initiate the World Biennial Forum and why do you think it necessary to have this Forum? MvH: Apart from a few important meetings that took place in the past, such as the Bellagio conference organised by the Rockefeller Foundation in 1997, IFA’s seminal series of talks “Biennials in Dialogue” in Kassel (2000), Frankfurt (2002), Singapore (2006), and Shanghai (2008), as well as the Bergen Biennial Conference in 2009, in Bergen, Norway, which lead to the publication of “The Biennial Reader”; the World Biennial Forum is the first professional forum for biennial makers globally. The World Biennial Forum not only aims to address the biennial as a curatorial platform, but also as what has become one of the most important cultural institutions existing globally today. The World Biennial Forum enables practitioners from various biennial initiatives in the world to meet and exchange ideas on common practices, share expertise, as well as to discuss the foremost topics and concerns in the arena. Over one hundred-fifty contemporary art biennial organizations operate around the globe, sharing similar objectives. The World Biennial Forum is the only independent platform connecting them. VS: Looking at the upcoming first WBF’s title – Shifting Gravity (Focus Asia); it is interesting to have the WBF alongside the Gwangju Biennale – Roundtable, which has been curated by six Asian curators. This will be an extended discourse on the discussions and case-studies that will take place during the three days of the Forum. Was this a basis of the selection of the topic of the first WBF? MvH: The focus on Asia came naturally. Both Ute Meta Bauer and Hou Hanru thought it would make sense to have this perspective for the forum in Gwangju. It is their curatorial concept, and I can only agree with them. So far, the discussion on biennials has mostly taken place in the West or from a Western point of view. The literature on this topisc is in fact still very scarce. It is important to have this discussion on this scale in Asia, a continent that is witnessing rapid expanding activities in contemporary art and a rising number of biennials. For all case study discussions the emphasis is put on the Asian continent and its margins, however for the Biennial Representatives Meeting, biennial practitioners from all over the world will attend and participate. The aim of this Meeting is to discuss common objectives for biennale organisations and their function in society for the first time in their 117 years history, and to jointly investigate and discuss the possibilities and benefits of collective and cooperative action. VS: Could you also tell us a little more about your views on the shift of focus to Asia and the way this is being looked at in Europe? MvH: The diverse yet interdependent societies of Europe and Asia have reached a critical juncture. There is a tremendous curiosity from Europe in Asia. While for centuries the European continent used to be the economical and cultural centre of attention, the eyes of the world are now on Asia and global interests have moved to the Asian continent. In Europe, a certain ‘biennial fatigue’ and skepticism towards the recurrent exhibition model has been observed since a while, especially amongst art professionals. In Europe, we are questioning ourselves about how we can recalibrate the biennial. How can we deal with the totalizing possibilities immanent in the encyclopaedic form of the biennial? It will be interesting to see in what way European biennial practitioners can be inspired by the exchange with their Asian colleagues. VS: On what basis did you select the case-studies to be presented, and could you briefly describe your vision behind the selection of Ute Meta Bauer and Hou Hanru as the Directors of the first WBF; and Wang Hui, Nikos Papastergiadis, Hans-Ulrich Obrist and Chantal Mouffe as keynote speakers? MvH: To ask Ute Meta Bauer and Hou Hanru was a decision jointly taken with Yongwoo Lee, the President of the Gwangju Biennale Foundation and an Advisory Committee Member of Biennial Foundation. Both Ute Meta Bauer and Hou Hanru have worked with the Gwangju Biennale before. Hou Hanru was co-curator of P_A_U_S_E: the 4th Gwangju Biennale in 2002, and Ute Meta Bauer was Visiting Professor of the Gwangju Biennale International Curator Course in 2011. The entire concept of the World Biennial Forum had to be developed from scratch. I created a general base and with Yongwoo Lee’s inputs it gradually took shape. It was Yongwoo Lee suggesting the appointment of two Directors. He also took the initiative for organising the Biennial Representatives Meeting. The keynote speakers and the case-study speakers have been selected by the Forum Directors. Wang Hui, Nikos Papastergiadis, and Chantal Mouffe will be addressing issues related to democracy, migration and cosmopolitanism. Hans-Ulrich Obrist is invited to stage one of his famous interviews at the forum. VS: For the first WBF, you have also extended your outreach to an artist's intervention by commissioning Choi Jeong Hwa to design the stage and Forum. Could you tell us a little more about this project? MvH: The World Biennial Forum No 1 will take place in the Kim Dae-Jung Convention Center in Gwangju. This centre is a huge venue, where the international art fair, Art Gwangju, normally takes place. We all felt it was important to create a more intimate atmosphere, allowing all participants to exchange in a different manner, i.e. not the standard and traditional conference way. The idea to invite the internationally acclaimed Korean artists Choi Jeong Hwa came up, as his practice is very playful and colourful. People can touch or walk through and around his spacious installations. Choi Jeong Hwa has been to Gwangju for a site-visit and he is creating a work especially for World Forum No 1. We gave him carte blanche and we are curious to see what it will be like. VS: How do you envision the WBF contributing to the development of Biennials and art practices? MvH: When Elena Filipovic, Solveig Øvstebø and I were organizing the Bergen Biennial Conference in 2009 in Bergen (Norway) our curatorial perspective was research. We invited both curators and academics and tried to bridge the gap between them. The outcome of this conference was “The Biennial Reader, An Anthology on Large-Scale Perennial Exhibitions of Contemporary Art” a theoretical reference resource that we felt was missing in the field. The scope of the World Biennial Forum is quite different. The World Biennial Forum aims to be a recurring event shaped especially for biennial makers and their collaborators. The scope of the World Biennial Forum is to provide a multilateral convention platform where biennial makers can meet their peers, where they can learn about innovations in biennials, where one can be part of and join a global biennial network, where one can find partners for collaborative projects, and where one can present and share with international colleagues. Both, the most established and young and upcoming biennale initiatives are invited. The idea is to create a collegial spirit and contribute to the further evolution of the biennial – not only as an exhibition format, but also as a cultural institution. VS: Will you be planning future editions of the WBF alongside Biennials? And with over 150 Biennials internationally, on what basis will you select a location for the next edition of the WBF? MvH: Yes, interest has been expressed from a few potential future partners in the Americas, Europe and Africa. Some will be coming to the forum in Gwangju, which I’m very happy about. We will just have a dialogue with them and see in what way it can be interesting and feasible from both sides. I used to work at Manifesta Foundation for many years, and somehow the concept of the candidacy procedure can be similar. The forum can be hosted in different biennale sites in the world, every two or three years, whenever and wherever it is meaningful and relevant. During the first Biennial Representatives Meeting in Gwangju, I hope we can create a Biennial Board with whom we can jointly assess and decide on future host sites for World Biennial Forum No 1 and 2, and the rest to come. The future is open. We are just at the start, of a great start. I’m grateful to the Gwangju Biennale Foundation who took the initiative to host our premiere in Gwangju. It is reflecting their ongoing pioneering position in the world of art. 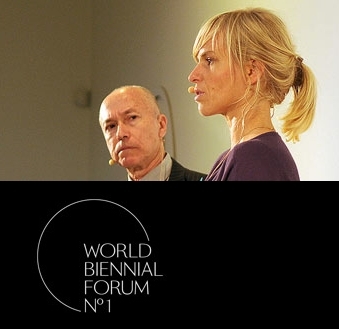 The 1st World Biennial Forum is an international convention, the first of its kind for biennale organizers and related professionals that will take place in Gwangju, South Korea coinciding with Roundtable - the 9th Gwangju Biennale (September 7 – November 11, 2012). It is supported by the Asia-Europe Foundation as part of the programme Creative Encounters: Cultural Partnerships between Asia and Europe.